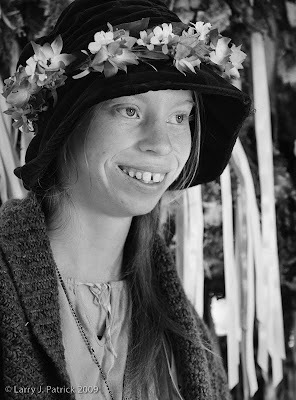 As I was walking around the Renaissance Festival, I am constantly looking for people who, to me, have interesting faces. When I saw this young lady, I really thought that she would make a great photo. But, I must admit, I was not really sure how I wanted to photograph her. As Bob will attest, I moved her around from one background to another, and to be honest, I never really saw what I wanted. I finally settled on a relatively simple background that had more texture than color to it. When I saw the image on the screen, I immediately thought black and white—which really simplified the overall image and made the young lady come forward. Camera settings: Nikon D3, Nikon 70-200mm f/2.8 at 135mm shot at ISO 200, f/5.6 and 1/90th of a second with a SB-800 flash in a softbox at camera right. Photoshop—used nik Color Silver Efex to convert the image to black and white. Nice job with this shot Larry. Going B&W was the right thing to do. I remember you spending some time with this young woman trying to get the right background in the shot. She has a wonderfully genuine smile that is contagious and you did a terrific job to capture that! A very simple portrait that seems to capture a nice young lady. I like your choice of black and white. Not my favorite, but I can see what you are trying to do. This is an extremely good portrait. It proves that you can take really nice portraits of people who may not be considered as one of the "beautiful people." Good work and I hope you do more like this. What a great face and matching wardrobe for an interesting portrait! Norman Rockwell would be proud. I really like the black and white conversion. Among other things, it helps subdue what might otherwise have been too busy a background. And you managed to get light up under the brim of that hat and get catch lights in her eyes. I take it your SB800 and softbox were off camera on a light stand or a monopod and in pretty tight to get the light fall-off across her face. Looks like f/5.6 was a good choice for getting her whole face and the flowers on her hat brim in focus, while still bluring the background nicely. Good work. Thanks for helping train the rest of us in the art of street photography. How Do You Show Action with Just One Frame?